Presidential granddaughter Isabelle Duterte with her red (left) and kohl-colored (right) Céline luggage tote bags. 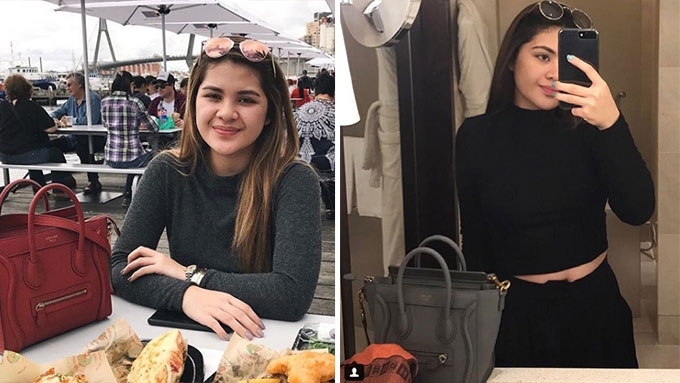 Presidential granddaughter Isabelle Duterte is now on the radar of fashionista netizens after her pre-debut photos inside Malacañang Palace went viral. Isabelle is the 17-year-old daughter of Davao City Vice Mayor Paolo Duterte and businesswoman Lovelie Sangkola Sumera. To date, the aspiring celebrity's Instagram account—with handle name @isabelleduterte—has only 37 posts, but has already racked up 29,200 followers. Based on her feed, the young lady loves Céline handbags, which are constantly part of her selfies. Last November 29, Isabelle uploaded a photo taken during her trip to Sydney, Australia. A red Céline luggage tote was visibly seen on the bottom-left corner. In May 2016, Isabelle brought her marine-colored Céline handbag to Japan. In April, she also uploaded a bathroom selfie featuring the same design of Céline handbag in khol color. According to Céline's official website, their nano-luggage bag retails at $2,700 or at least PHP135,000 per piece. Céline debuted its Luggage Tote, which was designed by the 44-year-old British fashion designer Phoebe Philo, in 2010. The bag is currently available in five different sizes: Nano, Micro, Mini, Medium Phantom, and Large Phantom. Its price tag ranges from $2,100 to $6,200, depending on the size and the materials used.